Boca U23 teammates Teddy Niziolek (Seton Hall) and Chris Konopka (Providence College) were honored by the BIG EAST Conference at its 2006 annual men’s soccer awards banquet as both, along with former Boca standout Marlon LeBlanc, head men’s coach at West Virginia University, garnered All-BIG EAST recognition from one of the top men’s college soccer conferences in the United States. SOMERSET, NJ (November 2, 2006) – Three Jersey Shore Boca club standouts, Chris Konopka (Toms River), senior goalkeeper from Providence College, Teddy Niziolek (Clifton), senior midfielder from Seton Hall University and Marlon LeBlanc (East Windsor), head men’s coach at West Virginia University were honored by the BIG EAST Conference at their annual men’s soccer awards banquet as Konopka and Niziolek garnered All-BIG EAST Second Team honors while LeBlanc was tabbed BIG EAST Coach of the Year for the 2006 season. Konopka, a long-time Jersey Shore Boca veteran and Niziolek were members of the Boca U23 team this past summer that advanced to the semi-finals of the USASA U23 Regional Championship as well as the semi-finals of the MSSL Cup Championship while LeBlanc was part of the two-time Boca NJ State Cup Championship teams coached by Dave Ellis in the early-1990s. Konopka, a 2003 Toms River East graduate, is only the second Friar goalkeeper in school history and the first since Dan Pires (Ludlow, MA) in 1996 to be named to an All-BIG EAST Conference team. In 16 matches this season, Konopka has posted a 0.87 goals against average, a .806 save percentage and six shutouts. Most recently, the standout keeper made five saves to preserve the Friars’ 2-0 playoff victory over Louisville in the first round of the 2006 BIG EAST Championship Tournament. He ranks in the top five in the BIG EAST in saves (58) and goals against average (0.87). In conference games only, Konopka finished fourth in minutes played (1000) and fifth in goals against average (0.90) to help the Friars win a school record seven BIG EAST regular season conference matches. Niziolek, a 2003 Clifton High School graduate, capped an impressive career with All-BIG EAST Second Team honors. The veteran midfielder had a career-year, tallying five goals and four assists for a career-high 14 points. Niziolek scored two game-winners this year, including the overtime tally to help the Pirates rally for a 2-1 win at Georgetown. He also showed his versatility and all-around soccer ability when he had to fill in on the backline for four games, during which the Pirates posted a pair of shutouts. 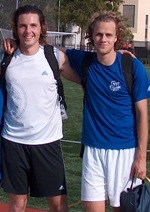 Niziolek played in 79 games of his career, starting 78 of them. In his first year as a head coach, LeBlanc has led West Virginia to new heights. The Mountaineer head coach earns the honor for the first time in school history after leading their program to a record of 15-1-2 overall, 9-0-1 in the BIG EAST. LeBlanc guided his team to its first BIG EAST regular season divisional title and the No. 1 seed out of the Blue Division in the 2006 BIG EAST Championship. The Mountaineers have spent eight consecutive weeks ranked in the national polls and earned a ranking as high as No. 4 nationally, also a first for the program. West Virginia is currently on a nine-game winning streak and is three wins shy of the school record of 12 set in 1966. The awards were presented on Thursday night at the conference’s annual men’s soccer awards banquet in Somerset, N.J. on the eve of the 25th annual BIG EAST Men’s Soccer Championship. The event will continue on Friday, Nov 3 with semifinal action at 3:00 and 5:30 p.m. at the Soccer/Lacrosse Stadium at Yurcak Field on the Rutgers University campus, live on CSTV (College Sports Television). The Red Division’s No. 3 seed, St. John’s, will meet Konopka and Providence, the fourth seed in the Blue Division in the day’s first game. Top-seeded in the Blue Division, LeBlanc and West Virginia will take on Red Division second-seed and host Rutgers in the second game. The winners advance to Sunday’s championship final at noon, which will be televised by several regional cable outlets. Jersey Shore Boca has over fifty club standouts, including Niziolek, Konopka and LeBlanc, who previously played for Boca on either their Men’s, Super Y-League, PDL, Club or Youth teams that are participating in NCAA intercollegiate soccer in 2006 for their respective institutions across the Unites States either as players or coaches.